Hotaru Tomoe is a human being and a Sailor Senshi from the series Bishoujo Senshi Sailor Moon. Overall cheerful, but meek and quiet; aside from the Senshi Hotaru didn't have a lot of friends before Apocalyptica. In Apocalyptica she bonded closely with the other two girls closest to her age, forming a sisterly bond with them. She hates being alone, which sometimes can lead to bouts of depression. Although she appears to be about 11 or 12, Hotaru at times can act much more mature, probably due to how many times she's been reborn. Hotaru cares deeply about other people, which is reflected in her ability to heal. Like the other Sailor Senshi, Hotaru has the ability to transform into Sailor Saturn. Sailor Saturn is the most powerful of the four Outer Senshi, and one of the most powerful Senshi, second to Sailor Moon. She wields the power of death and rebirth, which may be a cause for concern for some but as she says there is no rebirth without death. However the power of death is a double-edged sword; using any of her attacks (aside from the defensive "Silent Wall") can and will destroy her as well. Her most powerful attack can destroy an entire planet. During her third incarnation Hotaru wielded a strange purple energy-like power. Consciously she was able to use this power to heal small injuries, although using it even the littlest bit weakened her considerably. However she could also discharge this power in blasts of destructive energy, normally when she felt threatened. Hotaru had no memory of using the destructive side of her powers, most likely due to the fact that Mistress 9 was in control of her body during those times. After being reborn Hotaru has regained her power to heal, and without the presence of Mistress 9 weakening her is able to handle using it better, can use it for longer periods of time and on bigger injuries. In the beginning she was Sailor Saturn, one of the four Outer guardians of the Silver Millenium. Like the other Sailor Senshi she fell when the Moon Kingdom was attacked by Queen Metallia. However her soul was saved by Queen Serenity and sent to Earth where it could be reborn. Saturn was reborn as Hotaru Tomoe, the daughter of Professor Souichi Tomoe and his wife, Keiko. Keiko died when Hotaru was a very small girl. When she was about eight or nine years old, Hotaru was with her father in his laboratory when an experiment when horribly, horribly wrong and she was killed. Driven by guilt and grief, Professor Tomoe accepted the deal of a Tau Ceti entity known as Pharaoh 90. In exchange for Hotaru's ressurection, Tomoe would help bring about "The Silence". Hotaru's new life was filled with sorrow and pain. She was sickly and weak, prone to seizures, fainting spells and memory lapses. She was an outcast at school because of her odd habits and because of a strange power they claimed she had. At home Hotaru was terrorized by her step-mother, Kaolinite. Her life began to turn around the day she met a pink-haired girl named Chibiusa. Unlike the other kids, Chibiusa wasn't afraid of Hotaru nor was she freaked out by her special powers. Hotaru and Chibiusa became fast friends with each other. However, Hotaru was being watched carefully by the other Outer Senshi. They had recognized her as the reborn Sailor Saturn, a sailor Senshi they feared because she had the power to bring about the end of the world. The Outers were prepared to take drastic measure to ensure that Saturn never awoke, even if it meant killing Hotaru. But in the end it was not Sailor Saturn who awoke to bring about the Silence, but another Tau Ceti entity named Mistress 9. Mistress 9 had possessed Hotaru when Professor Tomoe had asked Pharaoh 90 to ressurect her, making her the source of some of the bizarre powers Hotaru had manifested. After fully awakening Mistress 9 attacked the Sailor Senshi and took the Holy Grail, triggering the Silence. Despite Mistress 9's claims to the contrary Hotaru's personality had survived, and she fought with Mistress 9 for posession of their body. Sailor Saturn emerged victorius. She thanked Sailor Moon for protecting her before preparing to destroy Pharaoh 90 by herself, explaining that without death there can be no rebirth. Thanks to Sailor Moon, Hotaru was reborn yet again, this time as an infant. Returned to the custody of her father (who had no memory of his actions under the influence of the Tau Ceti), it was hoped that Hotaru could grow up a happy, healthy normal girl. Unfortunately this would not come to pass, as Queen Nehelenia re-emerged as a threat and Hotaru was taken from her father by Sailor Pluto. Raised by the three Outer Senshi, perhaps as penance for their earlier attempts at killing her, Hotaru rapidly aged from infancy to pre-adolesence in a matter of days before reawakening as Sailor Saturn. Rejoining the Sailor team, she aided in defeating Nehelenia a second time. After Nehelenia was beaten, Hotaru returned to her home with the other Outer Senshi. But when she woke up from going to bed, it was to find herself in the middle of a barrent wasteland. Hotaru was one of dozens of people, from dozens of different worlds, who suddenly found themselves citizens of a post-apocalyptic Earth. Taking shelter in an abandoned apartment building, Hotaru struggled to make sense of what her life had become. The refugees of this world, Hotaru among them, came together and formed a community. They struggled to survive against elements such as acid rain, and the threat of vampires and alien monsters called "Magog". Hotaru found her niche in the community's infirmary, putting her healing powers to good use. Hotaru also formed a bond with two other girls her own age who had been brought there. She moved in with Meng and Molly after another community member was attacked. Eventually they adopted each other as sisters. After spending a little over a year and a half in Apocalyptica community members began to disappear. Although no explanation for the disappearances was ever found, the unspoken hope was that whatever had brought them there was now taking them back home. Then one night Hotaru went to sleep in the apartment she shared with Meng and Molly…and woke up in the Digital World. Hotaru found herself in the city of Axyori, in an alleyway. She met her partner Lunamon, and not too long afterwards was found by Shego and DemiDevimon, who bought Hotaru lunch and then helped her in getting to Tetha. She remained in Tetha healing first Yuffie then later Koushirou Izumi. It was after she healed Koushiro that Hotaru was invited to move in to the apartment that would later be labeled the "TARDIS". Hotaru tried to live her life as normally as possible. Not long after her arrival in the Digital World, encouraged by similar posts from Tommy Oliver and Rose, Hotaru revealed her identity as Sailor Saturn to everyone on the comm system. During the festival at Tetha she was encouraged by Lunamon to sign up for the talent show, playing a piece on the violin that she had composed herself. She didn't win, but took the loss well. It was during the Tetha Riot that Hotaru discovered she could transform again. As Sailor Saturn, she fought alongside her roommates then accompanied Ryo back to the TARDIS so that she could heal Koushiro (again). After the fallout from that had settled, Hotaru went to the Matsuda Bakery to heal Takato Matsuda, who had also been injured during the rioting. She also attended a meeting at the Silver Dragon during which Team W.I.T.C.H. notified their allies of the Nerissa threat. Not long afterwards, in early May, Hotaru was summoned to Pirate Cove, and was told by Captain Jack Sparrow that she had been chosen to serve on the Brethren Court. She was surprised, having gotten used to her life's mission being to serve the Silver Millennium. But she went to Pirate Cove anyway and accepted her new position as a Pirate Lord. In late May Yggdrasil awoke and undid all of Koushiro's hacking, returning the TARDIS to its original state; like its other residents, Hotaru was not too happy about this turn of events. She changed her address to the Hinata Inn/Silver Dragon after the TARDIS-crew moved there, taking up a majority of the third floor of the apartment complex. Summer also found Hotaru participating in more battles; in July she was part of the force that defended Tetha from attacking Gizmon. She also wound up taking Anei Yagami under her wing when the half-Digimon girl decided to be "proactive" rather than evacuating the Dragon with the others. In August Hotaru joined the other Pirate Lords in helping Team W.I.T.C.H. and the other Dragon residents in their strike against Doom, retribution for his earlier attack on the Dragon. August was also when Hotaru received a surprise of her own when Meng, one of her sisters from Apocolyptica, was brought to the Digital World. With Ryo's permission, Hotaru brought Meng into the TARDIS, sharing her room with her. In September Hotaru, along with Ryo and the remaining TARDIS-crew, temporarily moved to Royal Base to get away from the chaos caused by Brewfest. During their time there she learned of roommate Mack's brain tumor. After finding out that Anei didn't know much about her own medical history (aside from a soy allergy), Hotaru saw to it that Anei got a thorough physical. Following the ending of Brewfest and the Seven Sins virus, as well as the aftermath of Koushiro's rescue from Vadermon, Hotaru was one of the few members of the TARDIS to return to the Silver Dragon. As of her latest birthday, Hotaru became the proud owner of her own, brand new pirate ship. After much (off-screen) deliberation she decided to christen it the Molly, after the foster sister she and Meng left behind in Apocalyptica. In February Tetha once again became a hotbed of battle, when the villain known only as LOT, allying him/herself with Slade and Billy Numerous, invaded the floating city with an army of Digimon, Sladebots and Billy-clones. 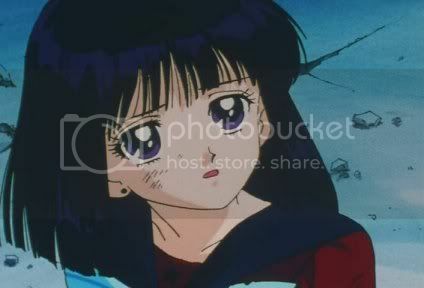 Hotaru, as Sailor Saturn, remained near the inn and did most of her (again, off-screen) battling there. Once the invasion was finished Ravemon declared the official establishment and presence of a military police force in Tetha. Not feeling comfortable with this turn of events, Hotaru decided to retreat to the Molly with Meng, inviting other members of the TARDIS crew to join her. Hotaru already knows Sokka and Azula, as she met alternate versions of them in Apocalyptica. Because of Apocalyptica!Azula's actions, Hotaru was mistrusting of the first Azula in the Digital World despite the latter's claims of repentance. In Apocalyptica Hotaru was unable to summon her hensin wand or transform into Sailor Saturn, although her healing abilities remained intact. Although she hasn't used any of her offensive attacks yet, it is most likely that Yggdrasil has lessened their power considerably. In all likelihood, if she were to use her "Silence Glaive Surprise" attack, it would cause some property damage but wouldn't kill her as it would before. After Meng's arrival in the Digital World, Hotaru officially adopted her as her younger sister. Despite the fact that her health is better than it was before, using her healing powers still takes a lot out of Hotaru. To that end, Meng has given everyone in the TARDIS (and perhaps everyone in at the Dragon/Inn) blanket permission to yell at Hotaru if she extends herself too much using them. Although normally Hotaru uses Japanese honorifics, she will sometimes call Meng "meimei", which is 'little sister' in Chinese. She picked it up from when she worked with Simon Tam in Apocalyptica's infirmary.